2008-Present (AXYS ALSO) POLARIS 800 CFI 12HP or 20HP "Drop In" Piston/Head Kit 2 DIFFERENT KITS TO CHOOSE FROM. BOTH ADDING PERFORMANCE AND RELIABILITY TO YOUR ENGINE! 2008-Present (AXYS ALSO) POLARIS 800 CFI 12HP or 20HP "Drop In" Piston/Head Kit 2 DIFFERENT KITS TO CHOOSE FROM. BOTH ADDING PERFORMANCE AND RELIABILITY TO YOUR ENGINE! NOTE: The REV 2 kit was designed to give near 100% full lower skirt support for the piston. This lack of lower skirt support is a major contributor to why the stock pistons FAIL! This piston is designed UNLIKE any other piston out there! ALL other kits out there REMOVE lower skirt support by shimming the cylinder up. This kit ADDS lower skirt support! 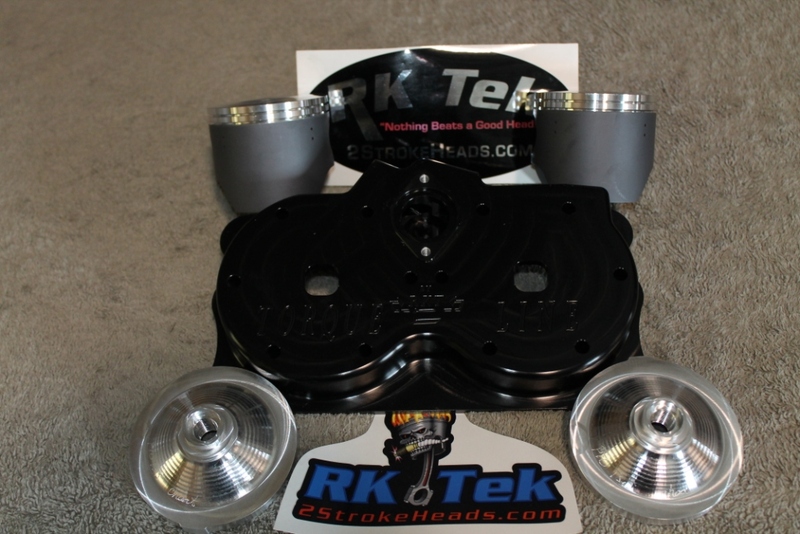 This kit WILL outperform ANY other "Bolt On" product you can buy for this engine! This piston WILL address all the issues associated with the OEM Piston! The piston is custom designed with different ring location and oil feed holes. After MANY tear-down and inspections, these kits have PROVEN to be solid and, more importantly, to fix the issues that are associated with running the OEM piston. Serious HP (12HP (Rev-1 Kit) (20HP Rev-2 Kit) is realized and the reliability IMPROVED for a very small cost! NOTE: The AXYS (HO engine) is more difficult to add HP. The REV 1 kit closer to 9HP and the REV 2 can get 16-18HP BUT will require an aftermarket pipe. You can NOT get this kind of power AND address an internal engine problem anywhere else for this low of price! The REAL "HELP" will come in the form of 2 Custom Pistons and a Custom Head that will completely transform your engine into what it should have been from the Factory! With our custom piston geometry, the porting is altered resulting in huge HP and Torque gains! Piston side loading is reduced due to our unique piston's weight. Yes, this piston is lighter than the OEM piston and having a lighter piston will reduce piston side load pressures AND reduce the stress on the crank! Also find that annoying vibration is gone with these pistons..
You know how the PRO likes to "shake" at low idle? We find that the OEM Polaris Piston will NOT hold its form after a very short time of running. We have found it common to see the piston to cylinder wall clearance DOUBLE in less than 1000 miles.. THIS is the #1 reason behind these cylinder failures associated with the Polaris Engine!! NOTE: This is VERY important...These pistons have a VERY unique design criteria. You do NOT have to treat these pistons any different (in any way, shape or form) than your stock piston! They require ZERO added "treatment"! They will NOT fail unless they are subjected to a low fuel or high heat condition! These pistons are the BEST piston available on the market today! BAR NONE! BEST PART: NO AFTERMARKET PIPE is needed! We, purposely, designed these kits to perform using the stock exhaust components! We have been doing these "Drop In" Kits for over 14 years on the Ski Doo and now we are applying our "expertise" to the "lacking" 800 CFI Power-Plant. There is NO DOUBT that this mod is the best mod for the money you can do. In fact, we designed this kit to run on the oxygenated fuel (Ethanol) and still use the NON-ETHANOL factory resistor!! So, it extremely safe on bad gas! How great is that? NOTE: This REV 2 kit WILL require a fuel controller (Boondocker OR Power Commander) AND will require aftermarket reeds (Boyesen or Vforce) AT any elevation BELOW 3500ft. Above 3500Ft. stock reeds work fine but the aftermarket reed systems will work better! The REV 2 Drop In Kit was dyno'd on 2 different engines (before and after) at Dyno Tech Research in 2014 and 2015 and showed a max power gain of 21HP with the STOCK Exhaust System and 91 octane PUMP GAS! These reports are posted for all Dyno Tech Subscribers to view. THIS KIT IS THE REAL DEAL!!!! NO GIMMICKS HERE! "Hey Kelsey. Put my drop in kit in today, nice stuff. On this sled also all the annoying vibrations and 3000rpm death-shake are gone. Smooth. The stock pistons were 3 grams different in weight. The RK Tek Pistons were a full 27 grams lighter and exactly the same weight to the gram. The old setup when idling the coolant temp would gradually climb of course and continue to climb without hesitation. Your head cools so efficiently that i never could get the temp over 133F it would just sit there. Even when brought up to 4500-5500 rpm the temp would slowly climb to 140F. What an amazing difference. Can't wait for good snow now. Turned the oil pump up one full turn and running 91 octane on the non eth resistor. 1/2 litre of semi synth oil in full tank fresh fuel. Anything else you think i should know bud shoot me a pm when you get a chance, i know your flat out. Have a good one man. have roughly 50 miles on my 2013 155 pro with kelsey's drop in kit with the higher compression head. I have "stacked" his set up with an slp pipe can power commander and my own clutching (not slp's set up). It is a noticeable difference. as far as track speed i do not know yet as we only have about 2 feet of snow right now. what i do know for fact is that with this set up running the slp stage 4 map which is def. on the rich side i was able to quite easilly beat a 2012 stage 4 slp pro 800 in a short drag race. not only that i am pulling 2 grams heavier weights than the same set up with out the drop in kit. and i'm pretty sure i'm going to have to add even more weight. the power band feels much SMOOTHER and it even gives the motor a lot crisper sound. I am sold on these kits so far after a little bit of experience around kelsey's product last year and this year. Lets just say that mine ran good enough not even broke in that i have already sold 7 more of kelseys drop in kits. Eric Woog (owner of VOHK) is also running these kits and he def. knows what he is doing when it comes to making power on sleds.